Announcing all help to the victims, the Union minister Raj Kumar Singh claimed that Unchahar had been the best unit of NTPC. LUCKNOW: A day after the NTPC power plant tragedy which resulted in loss of 30 human lives and left scores critically injured, there was a deluge of political leaders — both ruling BJP and the Congress — on Thursday at the accident site in Unchahar which falls in politically sensitive Rae Bareli Lok Sabha constituency represented by Congress president Sonia Gandhi. A number of BJP leaders, including Union power minister Raj Kumar Singh, and ministers of Yogi Adityanath cabinet trooped in with a number of announcements for the victims and their families. Singh visited the site on sixth floor of the plant and talked to the NTPC officials. 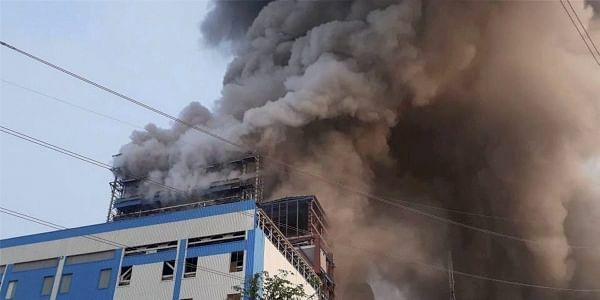 Singh, while talking to media persons, said that NTPC had set up a team of technical officials to look into the reasons for such a huge blast in boiler. However, he claimed that prima facie, it did not seem to be a human error. "Strictest action will be taken against anyone if found guilty of laxity at any level," he stated. Announcing all help to the victims, the Union minister claimed that Unchahar had been the best unit of NTPC. He sought to explain the technical aspect dealing with suspected accumulation of ash in the unit and subsequent blockage of steam evacuation path might have led to blast. The minister hoped that the technical team set up by NTPC would be able to ascertain the actual cause an accident of this magnitude. "This is the time to stand by the families of victims, share their grief and help them cope with the tragedy in every possible way," he stated. Singh was accompanied by UP deputy CM Dinesh Sharma and state power minister Shrikant Sharma. On the other, breaking his Navsrijan Yatra in poll-bound Gujarat, Congress vice-president Rahul Gandhi visited Unchahar in Rae Bareli to meet grieving families of those who died in the boiler blast. Rae Bareli is represented by his mother in Lok Sabha and Rahul visited it as her representative as she could not come for health reasons. He, accompanied by a battery of Congress leaders including Ghulam Nabi Azad, UPPCC chief Raj Babbar, party Rajya Sabha member Pramod Tiwari, Raja of Amethi Sanjay Singh, his wife Amita Singh, spent the first half of the day with the victims. Rahul visited the blast site and workers of NTPC. He also went to the mortuary and three hospitals where injured were recuperating. The Congress delegation, however, demanded a judicial probe into the incident. Rahul Gandhi did not respond to any of the media queries. After concluding his visit, the Gandhi scion only tweeted: "I am saddened by the pain of victims. They should be given better compensation, govt job and all possible help to injured."